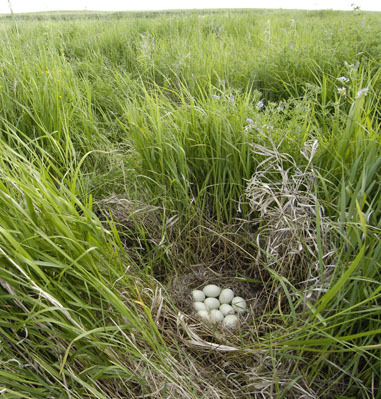 Birds, Turkeys & WaterfowlIs CRP on Life Support? Is CRP on Life Support? Is the Cadillac of Conservation Programs on Life Support? Weigh in, or face the consequences, says Delta Waterfowl writer Tori McCormick. It’s easy to get lost in the alphabet soup of federal conservation programs, but if you’re a duck hunter and care about the future of our heritage, there’s one acronym you simply cannot forget—CRP. CRP is the Conservation Reserve Program, arguably the most sweepingly beneficial, voluntary private lands conservation initiative ever hatched by the federal government. But the Cadillac of Conservation programs, it seems, is loosing its luster and support. The political class in Washington D.C., among others, is debating its importance and usefulness in this age of bio-fuels and alternative energy. Translation: The scalpel has been unsheathed and cuts are likely on the horizon. In fact, in September at a CRP “listening session” in Washington state, the U.S. Department of Agriculture’s Farm Service Agency announced that one of its “policy options” is to cut program acres nationwide from roughly 32 to 24 million. The “listening session” was part of nine public meetings across the country by the USDA to calibrate public opinion on CRP. Buckle up: CRP as we hunters know it is likely going to change, and perhaps radically so. The aforementioned “policy option” doesn’t, of course, take into consideration what’s actually happening on the ground right now. Here’s what we know for certain as for this writing: Conservation Reserve Program acres, especially in the all-important duck-producing Prairie Pothole Region, are being lost at an alarmingly high rate—a rate that common sense (to say nothing of scientific modeling) says will cut duck production (not to mention the production of other bird species, game and nongame) in the years ahead. Bottom line: More than 4.2 million CRP acres nationwide have been lost since 2005 (many hundreds of thousands in the PPR, and I’m not even taking into account the modern-day sod-busting of native prairie across the Dakotas), but that’s not the worst of it. In next five years, contracts on 21 million acres are expiring, millions of acres of which slated for the breeding ground states of the Dakotas, Montana and parts of Minnesota. The last thing CRP needs is more cuts, especially to its national enrollment. Reasonable people can debate if the current program needs to be augmented to better accommodate the daily needs of farmers and ranchers. What isn’t debatable is that CRP is wholly good for wildlife, the environment, farming, local economies and the public at large. Let me just say, diplomatically, that I beg to differ. Most CRP detractors (and I’m not talking about farmers here) have a very narrow, vested interest in seeing that CRP and its advocates go away. And one could argue (and many have) that groups like Delta Waterfowl have a very narrow, vested interest in keeping CRP alive and kicking. The problem for CRP detractors is that the program cuts a wide swathe; its benefits are cross-cultural, borderless and many. As a policy option, CRP has numerous tangible (and intangible) “public” benefits—even for its detractors, whether they admit it or not. CRP reduces the annual cropland soil loss by about 450 million tons—enough to fill approximately 37.5 million dump trucks and improving our nation’s water quality immeasurably. CRP has restored more than 2 million acres of wetlands and adjacent buffers—wetlands that clean our water, mitigate flooding, provide habitat for wildlife and fish, and more. CRP has protected more than 170 thousand miles of streams—yet another public benefit. CRP sequesters 48 million tons of carbon dioxide annually. CRP produces 15 million pheasants annually. CRP produces 2.2 million ducks per year in the Prairie Pothole Region, sending ducks to duck hunters in nearly every U.S. state. This is to say nothing of the economic benefits that have sprouted up organically from CRP being on the landscape for last 20-plus years. Ask the owner of some mom-and-pop greasy spoon in the hinterlands of North Dakota, or South Dakota, or Montana, or any other state, for that matter, if he or she does better when wildlife populations (ducks, pheasants, deer, etc.) populations are high or low. The answer is obvious, and can be linked in most cases to the many direct benefits of CRP. In fact, I’ve seen entire underground economies rise up like a Phoenix thanks in good part to CRP (I once profiled a South Dakota woman who cleaned pheasants, a population buoyed by CRP, for outstate hunters to buy Christmas presents for her family and the needy; she literally cleaned hundreds of birds and knew that smart conservation policy benefitted more than just hunters). What’s more, my reporting over the last decade suggests that the vast majority of farmers support CRP and its guaranteed income stream. They still do, too. Like I said before, many would like to see the program have more flexibility (let’s shelve that important debate for another day; stay tuned), but in sum they appreciate the fact that CRP, in part, inoculates them for the temperamental whims of global commodity markets and keeps them on the land. They’ve also benefited from CRP’s dynamic recreational economy. Where do Delta members and other hunter-conservationists fit into this debate? In the final installment of Delta Waterfowl’s series called the Vanishing Hunter, my editor, Dan Nelson, and I argued that the continued loss of hunters (waterfowl hunter numbers dropped 27 percent from 2001 to 2006, according to the 2006 National Survey of Fishing, Hunting and Wildlife-Associated Recreation) means that fewer will have to do more. Indeed, we need super-hunters to protect and support the conservation programs that make the most sense for ducks and other wildlife and benefit the most people. CRP is one such program, and its time that hunter-conservationists—super-hunters, if you will—to step up and protect our turf. Contact your elected officials. Write letters to your hometown newspapers. Get engaged. One person can make a difference. After all, and to dip my ladle into the alphabet soup of conservation-program acronyms, CRP needs a little CPR and TLC so it isn’t KIA. Tori J. McCormick is associate editor of Delta Waterfowl Magazine. Reach him at tmccormick@deltawaterfowl.org.